Last week was hectic. It was one of those weeks where I felt like I just couldn't quite keep up. I was late for a couple appointments for the book (I'm usually on time or early) and felt overwhelmed by too many freelance deadlines. In the mornings coffee didn't seem to have the usual zing to the point that it felt like someone may have switched my beans out for decaf. And then I drank tea. 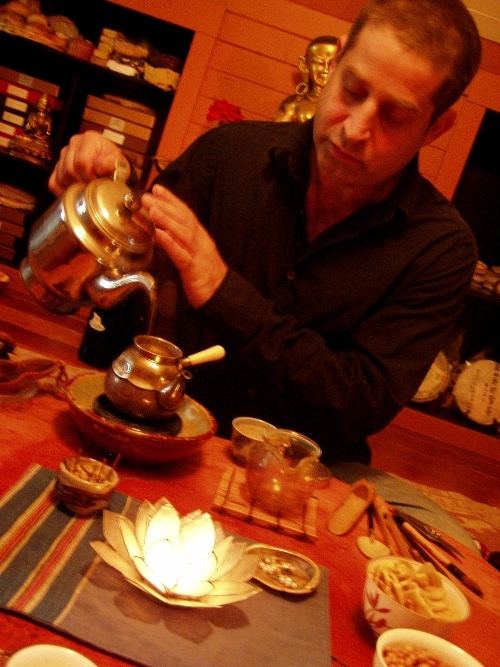 With the Tea Monk -- aka Paul Rosenberg -- of Portland's Heavens Tea and Sacred Arts Center. As I walked up to the big purple Southeast Hawthorne area bungalow that's home to Heavens Tea I felt a tug of deja vu and when I stepped inside and saw Robyn Shanti at the dining room table I knew why. I'd been to this house -- Shanti's house -- in late 2006 to interview her for a story for the Portland Tribune about the Sustainable Business Network of Portland and its Buy Local Day. A few months after that interview the Tea Monk moved in. 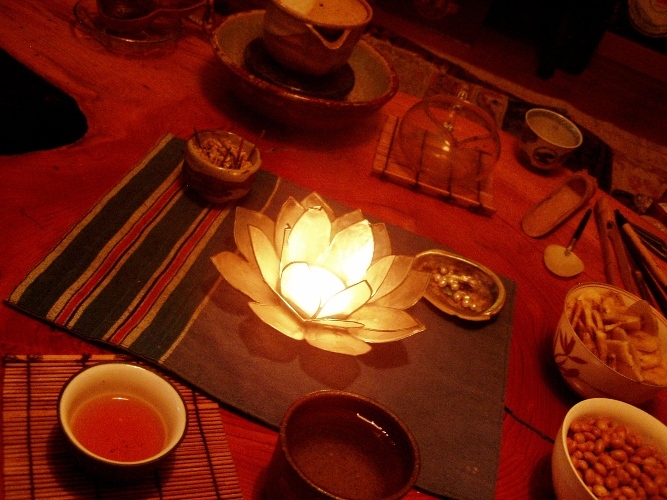 I talked to Shanti for a bit and then took off my shoes before heading upstairs for my date with the Tea Monk. At the top of the creaky staircase I was met with incense, candles, shrines and offerings, tea in all sorts of shapes and sizes, sacred art from various centuries and a tiny burl table with pillows for seats on an Oriental rug in the middle of the attic room. We took our seats across from one another and for the next few hours did nothing more than talk, laugh and tell stories over round after round of rare and transportive teas. I hope that more people will experience the magic that I did in drinking tea from more than 200-foot tall trees; tea from 1,500 year old trees; tea that tasted like the essence of root, bark and leaf from one steeping to the next. With a lot of aged puerhs -- which Rosenberg specializes in along with aged oolongs -- you can get more than 20 steepings from the tea. Each steeping brings something new to the cup. 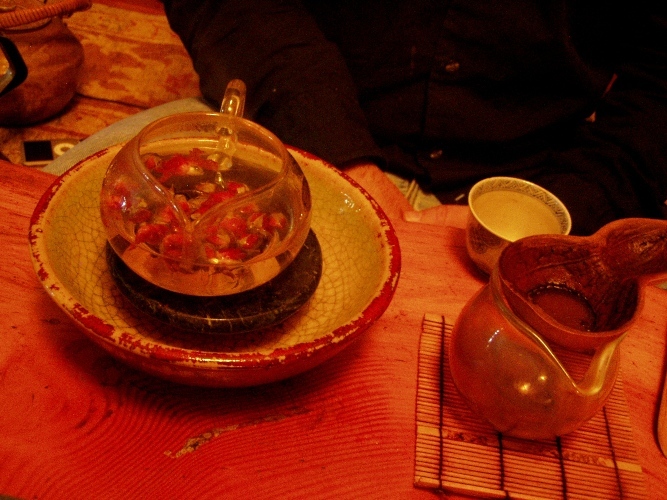 I tried a couple Chinese and Taiwanese teas that afternoon that were so deep and elemental in flavor that I had what Rosenberg refers to as "memories of things that never happened." I hope that's not just a nice way of saying delusional. White tea leaf buds from 1,000 year old trees in Yunnan Province. Flower tea -- sacred spring rose buds from Sichuan Province. The only time I ever went to Disney World was with my grandma and her friend when I was in elementary school. I rode some rides and they were ok but I wasn't all that impressed. I grew up in Cincinnati and was somewhat of an amusement park connoisseur. I had a season's pass to King's Island for years and one of my first jobs was at the Ohio River hugging Coney Island. Yes, that's the right name. Anyway, I wasn't wide eyed over the rides at Disney World due to my longest-wooden-rollercoaster background. What I was impressed with, however, was Epcot. Why? Food. Food from around the world. Particularly Chinese and Japanese food. I had never seen a lot of the teas, nori, rice crackers, wasabi peas and more that lined the shelves at Epcot's Chinese and Japanese "markets" and I used my allowance to buy as much of it as I could. I remember my grandma and her friend waiting under a tree outside as I sniffed jasmine tea from beautiful tin canisters and checked out lychee, plum and rice candies for a very long time. When I finally emerged arms filled mostly with spicy, salty treats I was worried that they'd be upset with me for taking so long but they weren't at all. They were just happy to be seated in the shade and free of me for a bit so they could talk. All of that brings me -- in a strange consumer culture way -- to my deep seated love of Asian markets and of course Uwajimaya. I don't get to this Asian mega-market often because it's in Beaverton but when I do I always spend a lot of time walking the amazingly diverse aisles and winking at the fish case. There are always beautiful specimens to wink at at this 10-plus year old market that got its start in Seattle. A while back there was talk of an Uwajimaya opening in Portland's Chinatown. I hadn't heard anything about it for months but I'm very happy to say that I heard last week through the tattoo grapevine -- my boyfriend is a tattoist here -- that it's happening. Chinatown Uwajimaya is on! Did you know that local miso existed in Portland? I didn't although I did know that plenty of tofu is made in our fair city. In fact I wrote a story about local tofu a few years ago for The Portland Tribune. I met up with husband and wife Earnest and Sumiko Migaki this afternoon of Jorinji Miso Products (Soy Beam Jozo Company) at the Seven Corners New Seasons. They've been producing local miso since 1996 in Southeast Portland and source all of their non genetically modified soybeans (they've refused GMO from day-one) from Ota Tofu in Southeast Portland. What's in the cellophane package next to the miso? Tiny cherry blossom shaped miso butter cookies made with organic eggs, unbleached flour, butter, sesame seeds, sansho and, of course, Jorinji Miso. My friend just stopped by the house to say hello and tried them. After the first one he asked where he could buy them. I told him he was out of luck, that they're only giving them to would-be purveyors (and very lucky writers) with samples of their white, red, dark red, low sodium, and katsuo miso. After hearing that he said a local restaurant should serve them as an after-dinner treat with the bill. I hope that someone does. They're buttery, salty, roasty toasty and end with just a smidge of sweetness. Not much though. That's why they're so good. Earnest and Sumiko's small batch miso is delicious. I tried some for the first time from Anzen Importers a few weeks ago and got in touch with the couple right after. Jorinji Miso is stocked in several local New Seasons Markets, City Market, Limbo, Uwajimaya, People's Co-op, Alberta Co-op, Anzen Importers and several other markets. It's also served at Biwa and Saucebox. Kimchi! I've been making kimchi for several years now and love how every batch is unique. 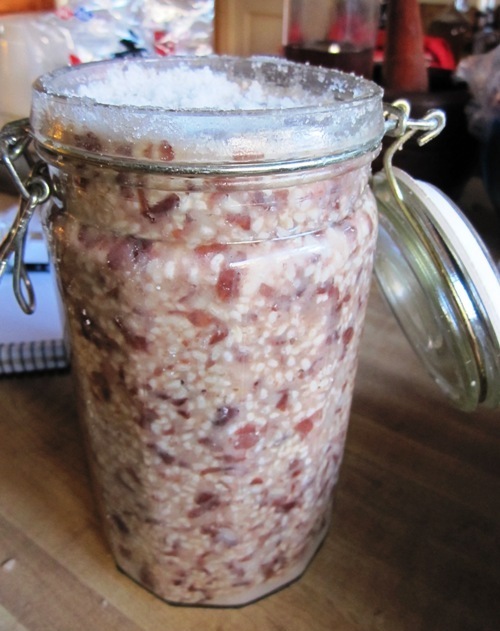 For this crock I added burdock, lotus root and dried chiles from a friend's summer harvest. I also used my new mandolin and I'm happy to say that this time all of my fingertips can still be inked and printed if I do something illegal. The last mandolin I owned was apparently a vampire. I signed my contract with Sasquatch on January 9th and have since been creating my master list -- a long list of all purveyors, farmers, chefs, food and drink artisans, ingredients and more that I want to include in the book. It's going to be an all-consuming and ongoing process -- businesses open, businesses close, and unfortunately there's been a lot more of the latter lately. The ethnic market chapter of the book sent me to Anzen Importers on NE MLK across from the convention center last weekend. 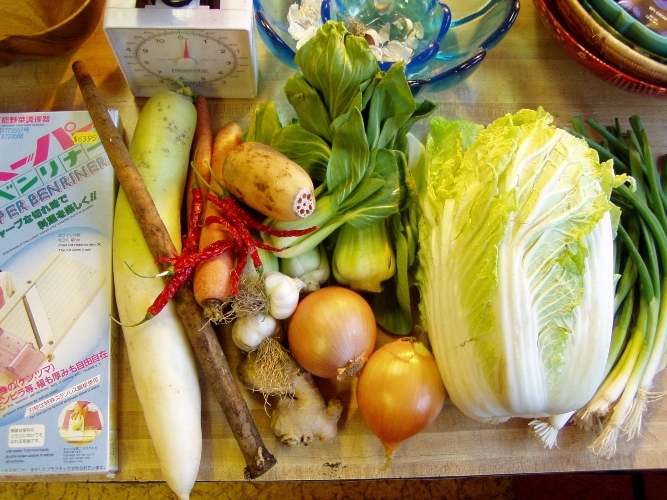 Before I knew it I had all the necessary ingredients for a big batch of spicy, fermented kimchi. I highly recommend this market. 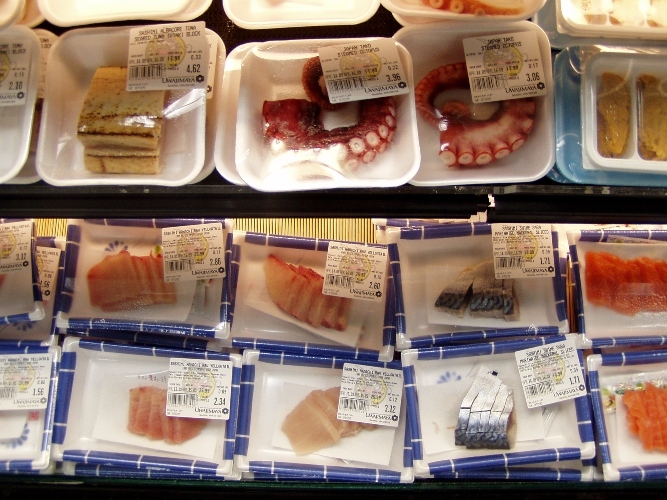 They carry tasty local miso, sushi grade fish, waikame salads, and a lot of nice produce.